90 West Street or West Street Building is a building in Lower Manhattan designed by architect Cass Gilbert and structural engineer Gunvald Aus for the West Street Improvement Corporation. When completed in 1907, the building's Gothic styling and ornamentation served to emphasize its 23-story height, and foreshadowed Gilbert's later work on the Woolworth Building. Originally built as an office building, the main tenant was the Delaware, Lackawanna and Western Railroad and the top floor was occupied by Garret's Restaurant, which advertised itself as the "world's highest restaurant." Located on West Street, between Cedar and Albany Streets, just south of the World Trade Center site, the building had a view to the Hudson River before Battery Park City was built on fill across West Street. In 1998, the building's exterior was designated an architectural landmark by the city's Landmarks Preservation Commission. 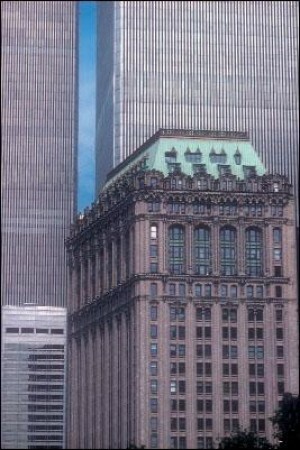 The building was severely damaged in the September 11, 2001 attacks when the south tower of the World Trade Center collapsed directly across the street.